Back then the Turkish delight (called raha in Arabic “راحة” which is the same Arabic word for comfort by the way ) was plain white. No food coloring, no added nonsense. Just little white cubes of bless dusted with sugar. For the Month of May, Rachael from Pizzarossa challenged us to make candy but not just any candy!She challenged us to make Turkish Delight, or Lokum. Challenges like this one are exactly why I love the daring kitchen, I would have NEVER attempted to make Turkish delights if I was not a member of the daring kitchen. It turns out the process is super easy! and the results are way better that the stuff you buy at the grocery store. Place the granulated sugar, lemon juice and 180ml (3/4 cup) of the water in a medium heavy-based saucepan over low heat, stir to dissolve the sugar. Allow the sugar mixture to continue boiling over low heat, without stirring, until it reaches 127°C (260°F) – hard ball stage – on the candy thermometer. Cold water test-Hard ball stage: Keep a little bowl of cold water near you, drop a spoonful of the sugar syrup into the cold water. The syrup will form a hard ball. If you take the ball out of the water, it won’t flatten. The ball will be hard, but you can still change its shape by squashing it. 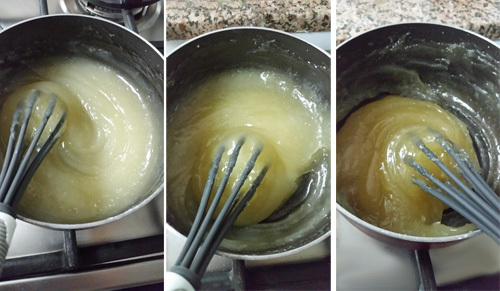 If the sugar syrup forms a soft squishy ball, it has not reached the desired temperature and it needs to be boiled more. This will take 10 – 15 minutes, depending on how high you have the heat. The edges of the mixture with start to turn light golden when you are close to the desired temperature. During the time it takes to bring the sugar syrup to the desired temperature, place the remaining 360ml (1-1/2 cups) of water in a medium heavy-based saucepan. Add the cornstarch and cream of tartar and whisk until the cornstarch dissolves completely. Place the saucepan with the cornstarch mixture over medium heat and bring the mixture to a boil, whisking constantly. The mixture will become thick and pasty. Once the sugar syrup is at 127°C (260°F), remove it from the heat. 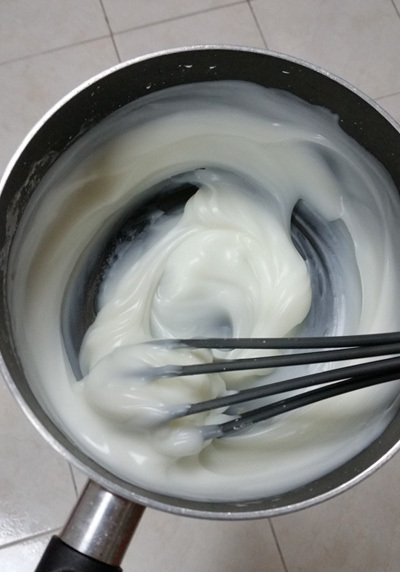 Very slowly and carefully pour it into the cornstarch mixture, whisking constantly until it is fully combined. Reduce the heat to minimum and let it cook gently, whisking it every 5 minutes or so, for about 40 minutes. The mixture will thicken and deepen in color. By the end of the 40 minutes it will be golden yellow, very thick and gluey. Be careful not to let it scorch – use a heat dispersal mat, if necessary. Meanwhile, prepare a setting container by lining it with plastic wrap with plenty of overhang, and lightly coating it with vegetable oil or nonstick spray. Remove mixture from the heat and whisk in the food colouring (if using) and the strawberry essence. Pour into the setting container and quickly spread with a silicon spatula. The mix will start setting really quickly, so work fast. Once completely cooled, loosely fold the plastic overhang over the top and let it set at room temperature for 6 – 8 hours or overnight. After the setting time ends, turn out of pan onto a board dusted with corn starch. Remove the plastic wrap and dust the top with corn starch, then cut into pieces with a large, lightly oiled sharp knife. 1.Allow it to set for 6-8 hours. 2. 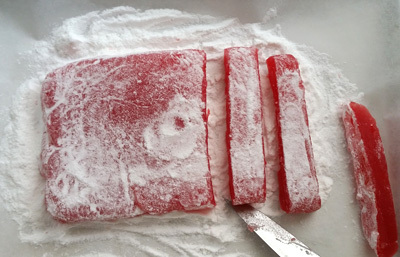 Some recipes recommend that after the initial setting, you should take the turkish delight slab out of the setting container, dust it with cornstarch then allow it to rest for another day. 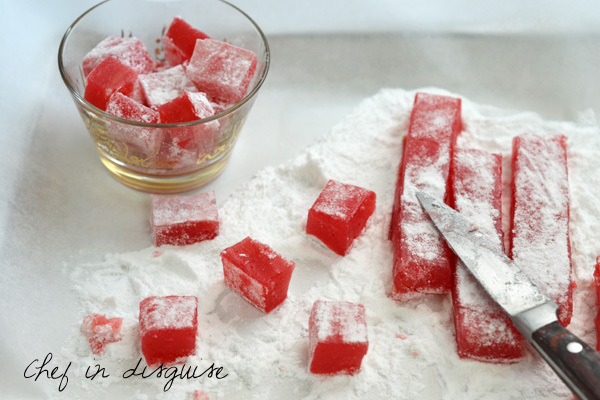 3.After that you can cut the Turkish delights into cubes, roll them in corn starch and allow 30 minutes before dusting them with icing sugar. دعي الخليط يغلي دون تحريك ، حتى تصل إلى 127 درجة مئوية (260 درجة فهرنهايت) – مرحله الكره الصلبه – على الحلوى الحرارة. وصول السكر لدرجه الحراره المطلوبه سوف يستغرق 10-15 دقيقة، اعتمادا على مدى ارتفاع الحرارة لديك. ستبدأ حواف الخليط بالتحول الى اللون الذهبي الفاتح عندما يقترب الخليط من درجة الحرارة المطلوبة. خلال الوقت الذي يستغرقه شراب السكرفي الوصول الى درجه الحراره المطلوبه ضعي كوب و نصف من الماء في قدر علىنار متوسطة اضيفي نشا الذرة وكريم منع التكلس (كريم تارتار) واخفقي حتى يذوب النشا تماما. خفضي الحرارة إلى أدنى حد ممكن،و حركي المزيج كل 5 دقائق أو نحو ذلك، لمدة 40 دقيقة. بحلول نهاية 40 دقيقة سيكون المزيج باللون الأصفر الذهبي، و سيكون سميكا جدا وغروي. .
دعيه يبرد تماما ثم غطيه بورق اللف الشفاف و اتركيه على حراره الغرفه 6 – 8 ساعات أو طوال الليل. .بعد تقطيعه الى مكعبات رشيها من كل الجهات بالنشا..اتركيها نصف ساعه ثم رشيها بالسكر . Posted in Arabic and middle eastern recipes, Daring cooks, Dessert and tagged chef in disguise, food photography, food stylist, homemade, how do I prevent turkish delight from sweating, lokum, middle eastern recipes, turkish delight, turkish delight sweating, UAE, uaebloggers, وصفه, الراحه التركيه, طريقه تحضير الراحه في البيت. Bookmark the permalink. l love Turkish Delight, It is so soft and sweet! Sounds yummy. Looking so soft and delicious. Funnily enough Turkish Delight also reminds me of my late grandmother! She and I were the only two in the family who adored it so whenever she came across it in a sweet shop (and we loved rose the best !) she would buy some and we’d sit and share it….happy memories 🙂 I’ve never made it but you make it seem pretty straightforward so when I’m back in England I will be giving it a go. Hope all is well with you Sawsan. Hi Sawsan, I was so excited when I saw your post. My daughter loves Turkish delight. I have never tried to make it but I may try your recipe. Thank you for sharing your recipe and the story about your grandmother. Your pictures are so pretty, those are beautiful cups. Looks delicious–I’m going to have to try it! Turkish delight is the only memory I have from reading the Chronicles of Narnia as a child! I love recipes like this…the kind that bring our memories (and even loved ones) seemingly alive again. I’m sure my kids would love these. I’ve never been a big candy person, but sandwiched between two cookies-I think your grandmother was on to something there! Isn’t is amazing how a recipe or even a smell can bring back warm memories and make your day? My kids loved these as sandwiches too! Ooh, I’ve never tried to make it myself! Doesn’t look as hard as I imagined. What a beautiful sweet treat!! أعمالك مميزه دائماً..تسلم يدك سوسن .. I adore Turkish Delight but it’s never occurred to me to make it. Perhaps I’ll have a go one day – I’m inspired by your recipe. This has been on my to do list for a year now, but I was waiting until Ramadan to make them. My friend brought me some back from Turkey and they were out of this world good. I love the ones with loads of hail the most. They look amazing mashAllah, great job. This makes me miss cooking along with The Daring Cooks. What a lovely treat, I didn’t know they were so easy to make too. I love Turkish delight too. This will be a nice treat to make for my relatives coming in June. I’ve made salt water taffy before but never Turkish delight, thank you for sharing the tips. Reblogged this on Kaperio's Blog. I love lokum! We have this delight in Greece. They’re so beautiful and yummy! I remember one of my classmates’ mother used to make some everytime a child from the class had their birthday. I remember the wonderful taste of those sweets and that there was none left after the party! PS- I must now make some Persian tea and reminisce about years gone by. Reblogged this on Indigo Food . 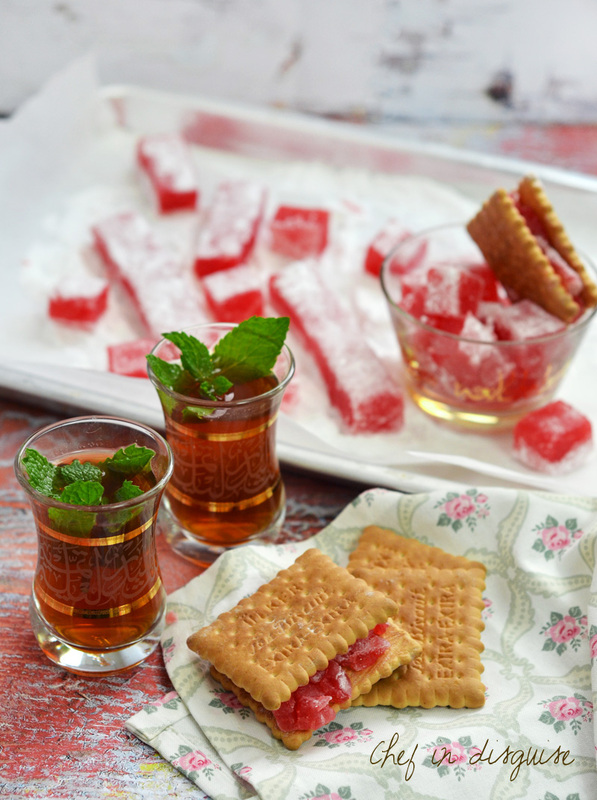 The tea with mint leaves looks good too, can you share the recipe? I did a combo of yours and one from another blog. Not too different in method. Mine is sitting waiting its 8 hours. I think it will be more brittle than chewy but no matter. I had no rose water or food colouring so used red berries soaked in a half teaspoon of orange extract. Was a perfect shade of pink until I added the pistachios! None of this matters. I’m making it for a group of children I’m working with on an Innu reserve. The Innu are indigenous people here in Labrador (once called Indians). I’m reading these children The Lion, the Witch, and the Wardrobe. The reason I’m telling you all this is because I found you through this recipe but it is the connecting with a woman from so far away and with such a different culture that is so precious. So thank you for braving to write a blog in a language not your own so strangers can become friends. Thank you. 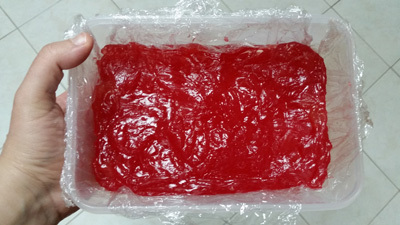 Turkish Delight made, but more importantly I am connecting with another woman who lives so far away, and in a very different culture, but who is really no different than I. Thanks for being brave enough to write a blog in a language not your own so strangers can become friends,! 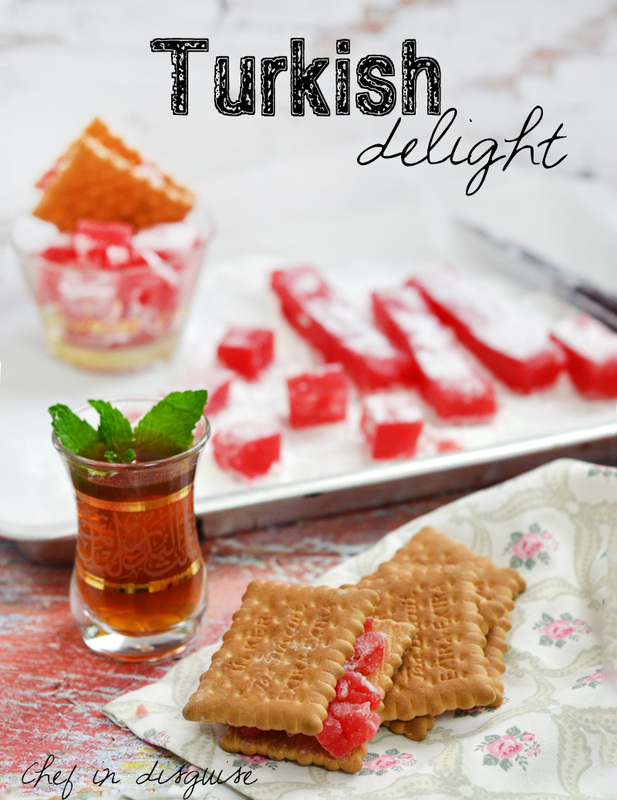 I have been looking for a commercial-grade turkish delight/lokum recipe for some time. I tried two so far — one was a total failure, and the other turned out very jelly-like. It was okay, but I suspect it should have been “harder” so to speak. I noticed commercial turkish delight is rather thick and hard, and doesn’t stick to your teeth when you’re eating it. Mine did. I’d like to ask what’s the consistency of this recipe? How hard will the turkish delight turn out if followed precisely and correctly? 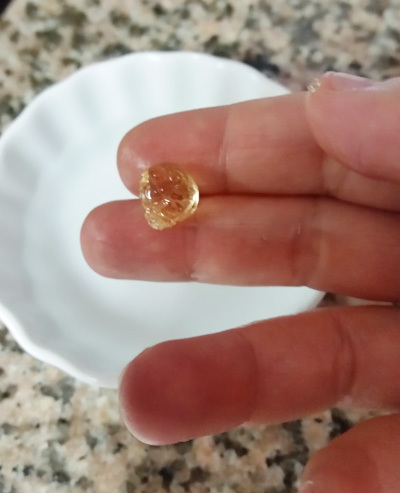 Will it be soft and jelly-like, and sticky, or will it have the consistency of commercial turkish delight, which is thick, hard, and not sticky? I have tried two previous recipes with two corresponding ultimate failures… you’re recipe was the perfect third time is a charm! I made this to use as a feeling for my maamoul for the coming eid. Thank you ! it’s a massive compensation for being away from home!